If you’re a Mustang junkie like me, this is a Field of Dreams. There’s a load of 1969/70 fastbacks, even a couple of Boss 302 bodies, and a slew of 1965/66 coupes. 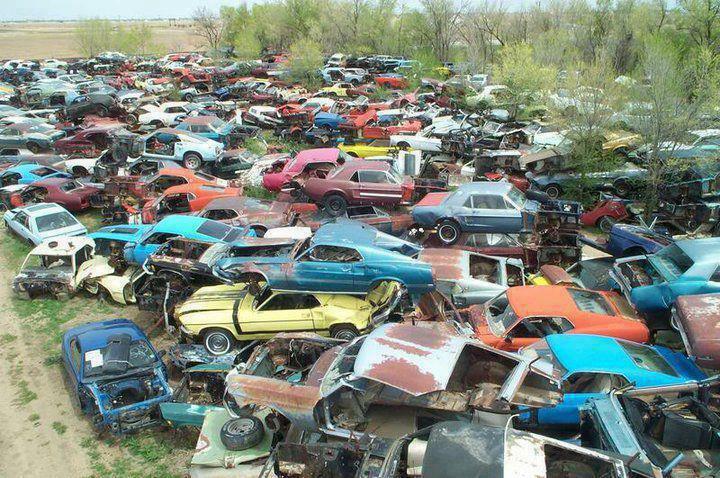 The car nut in me can only imagine taking a couple of those bodies and stripping good parts and making a new spotless body, then building from there. It’s not just the fact that restored Boss 302s will reach $100,000, or restored ’69/70 Mach 1s will reach $50,000. Rather it’s the creation of automotive art. I’m also a fan of old Packards and Deusenbergs. I grew up with Mustangs. My dad, both grandfathers and four uncles worked for Ford. My first car was a 1969 Mustang fastback. After I sold it, I missed it so much I bought it back. When the shock towers rusted out I had to get rid of it. Little did I know that it would become a collector’s car today. I also had a ’69 Mustang Mach 1 that I customized the hell out of. I wish I had pictures of it–I flared the rear fenders, blended in the side scoops, then painted it candy apple red with a gold pearl over the top. I painted a mural of a cobra on the hood, a mountain lake mural on the trunk, a pegasus behind each rear window. Appropriate for a souped-up Mustang, don’t you think? I had Boss 302 style stripes that I stenciled in “351CJ” (for CobraJet). Instead of continuing the Boss stripe behind the rear wheels, I morphed it into flames. How can you have a custom paint job without flames? Sadly, I sold THAT car too when it became impractical. I wonder what happened to that car? I had a lot of fun building it and driving it on Woodward Avenue. When it was running well not only could I burn rubber in first and second gear, I could get a good squeal in third and a chirp in fourth–with these big Mickey Thompson tires in the back. Now I’m on to more creative endeavors. This post will be free-form, recounting not only my motorized and travel adventures, but the adventure of breaking into the literary world. Post in response if you like. I look forward to sharing the next adventure. hello, my name is Daryl and i came across your photo of the field of dreams with hundreds of mustangs. may i ask where this filed of old mustangs would be and if its still there? I am on a tight budget but always loved the possibilities of purchasing a cheap 1969 mustang fastback and taking my time restoring it to a beautiful everyday driver. I’m afraid I don’t know where this picture was taken. I do know that “cheap ’69 Mustang” is a contradiction in terms, particularly for the fastback models. I suggest keep checking Craigslist and eBay, you’ll eventually come across a likely prospect.